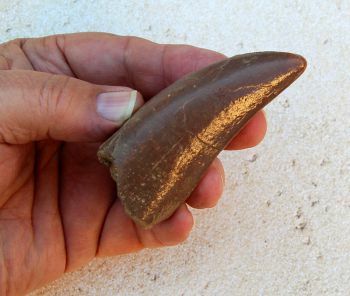 The original tooth was found in the Lance Formation of Wyoming and is 2.5 inches long and is missing all of the root. Yes, T-rex teeth were big and strong but they did break them while feeding and crushing the bones of other dinosaurs. These broken teeth are called shed teeth. Fortunately, when a tooth was broken or shed it was slowly replaced by another tooth growing out of the jaw. 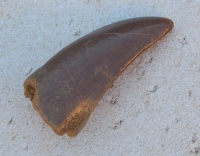 Its teeth were also serrated just like a steak knife or shark tooth. T-rex had a variety of sizes of teeth, from only 1 inch above the gum line to 15 inches including the root. T-rex was up to 12 feet tall at the hip, 40 feet long, & weighed up to 11 tons. Most specimens have been found in the western United States and Canada. They were the dominant predator of the upper Cretaceous Age which ended about 65 MYA years ago. Authentic T-rex teeth can sell for over $1000 per inch.